Shirley Boulter-Davis is among the elite top 1 % Nationwide at Re/Max for families relocated! She has been the Top Listing Agent in her RE/MAX office since 1998. Each year Shirley's dollar volume of closed homes consistently ranks amoung the Top 1% for individual agents in Texas. She has also been an elite International Platinum Producer for highest individual Unit Producer in the Dallas area. Shirley always says a happy family is a referring family. Her business is exclusively referral based. Shirley owes much of her success in handling large numbers of family moves to her background as a new home sales manager. She has managed the sales and marketing staff of some top volume builders in the Metroplex and has received top honors in almost every area of selling and managing. 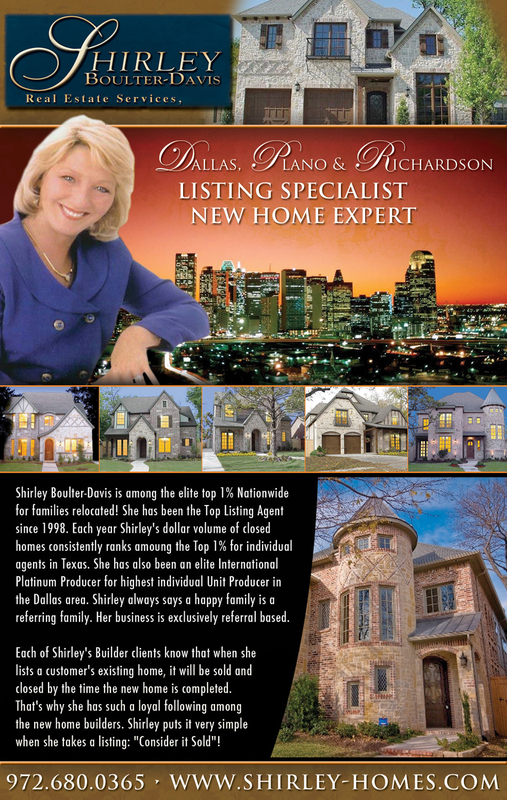 She has been Salesperson of the Year for a major home builder, McSam Sales Manager of the Year for the City of Dallas. National Sales Manager of the Year for the Southwest Region and a Top Listing Agent for RE/MAX since 1998. Each of Shirley's Builder clients know that when she lists a customer's existing home, it will be sold and closed by the time the new home is completed. That's why she has such a loyal following among the new home builders. Shirley puts it very simple when she takes a listing: "Consider it Sold"! Shirley has a Masters Degree in Music of Vocal Performance and has directed Church Choirs, performed in Musicals and is an avid fan of all that is art in the Dallas area. She can be reached by calling (972)680-0365. • Top Listing Agent in Collin County since 1999. Dedicated Marketing Professional with the background and knowledge to help you accomplish your Housing goals. Wheather it is Selling or Buying a Home, Shirley's years of winning experience can make a difference in your satisfaction level.